Twitter’s 140 character limit may be coming to end and I’m not sure how I feel about it. The company made the announcement today via blog post, where they laid out reasoning for a possible expansion from 140 characters in a Tweet to 280 characters. Why would they do that, you ask? Because their data shows that as people run into the 140 character limit and can’t put together a message they are happy with, they just don’t tweet. Actually, they find that to be a problem in languages like English, which by all means is a difficult one to properly convey a 140 character message in as you rant from your keyboard warrior sports podium. Languages like Japanese run into this issue far less. 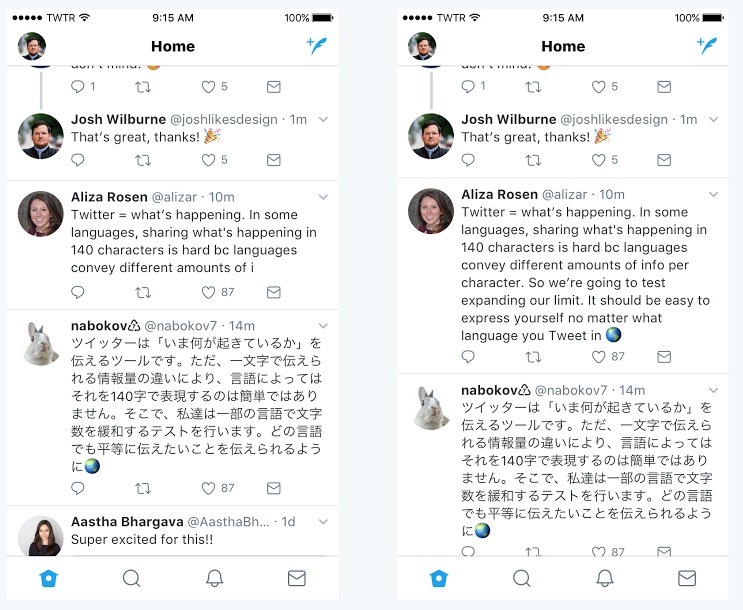 Twitter’s data shows that 0.4% of Tweets sent in Japanese arrive at the 140 character limit, whereas 9% of those in English do. That’s a pretty big difference. To start, the company says it will expand a small group of users to a 280 character limit in Tweets. They’ll look like the image below. Again, I’m still not sure how I feel about this. There is something poetic or challenging or perfect about 140 characters at this point. 140 characters is Twitter. Doubling that takes a piece of all of that a way, right? I don’t know. You tell me.